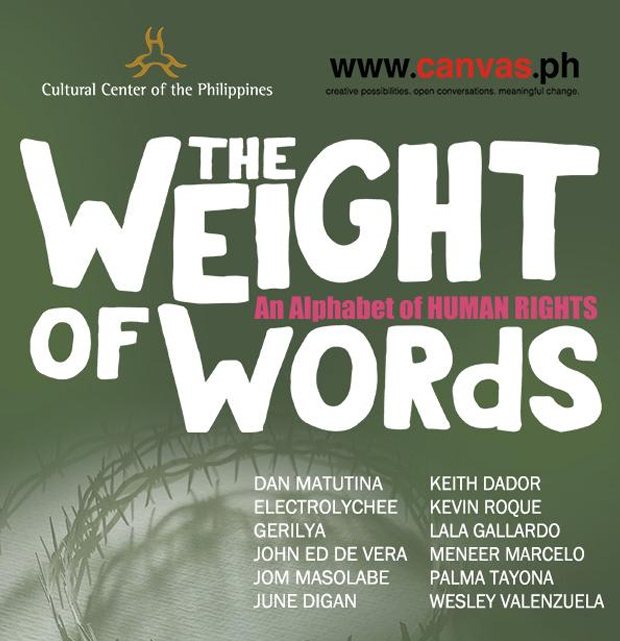 The Cultural Center of the Philippines and Canvas present “The Weight of the Words: An Alphabet of Human Rights,” which will be on exhibit from November 24, 2017 to January 21, 2018 at Pasilyo Guillermo Tolentino and Pasilyo Victorio Edades galleries. “The Weight of Words” exhibit is part of Canvas’ Looking for Juan Program, which explores art as a platform for social change. For the past 10 years, Canvas has been promoting art, culture and literature through exhibitions and publication of children’s books. Canvas continues to challenge the imagination of its audiences and participate in the social discourse. For this exhibit, participating artists and designers include Keith Dador, John Ed de Vera, June Digan, Electrolychee, Lala Gallardo, Gerilya, Meneer Marcelo, Jom Masolabe, Dan Matutina, Kevin Roque, Palma Tayona, and Wesley Valenzuela contemplate on the meaning and value of human rights using the alphabet. Each participating artist has chosen a letter or two and connected it with the concept of human rights. It hopes that with these letters, words, and arts, the universal truths about human rights can again be revealed, shared, reflected upon, and force an acceptance and commitment to the truth that human rights is not the cause of the chasm – it is the bridge that will unite. To value human rights is to uphold every person’s life and right to live with dignity. This includes the right of children to education, play, shelter, and care. It includes the right to not be discriminated against on the basis of race, color, religion, creed, gender, ancestry, age, or even disability. It protects our right to participate in politics, civil service, or the private sector; and ultimately, to self-determination. To value human rights is to believe in the sanctity of life and stand up for our freedoms: to speak, to assemble, to be free from abuse, even and especially from the State. “The Weight of Words: An Alphabet of Human Rights” is a call to reflect on the basics of human rights. The various works in the exhibition will be included in a book to be launched on the National Day of Human Rights on December 10. The book will be distributed for free to disadvantaged communities in the Philippines as part CANVAS’ 1 Million Books for 1 Million Filipino Children Campaign. For more information, contact the CCP Visual Arts and Museum Division at (632) 832-1125 loc. 1504/1505 and (632) 832-3702, mobile (0917) 6033809, email ccp.exhibits@gmail.com, or visit www.culturalcenter.gov.ph.